The Ceylon Electricity Board had activated a new hotline number of 1987 from any telephone lines, this hotline would cater to all your problems of electricity power failure, blackout, electric shortage and all other electricity issues. This Hotline Number have been announces after the several issues face by public to calling to electricity board when the country came under blackout situation in recent past. If you are from Royal college or St.Thomas College, its your time to celebrate your big Match from 10th to 12th March 2016. 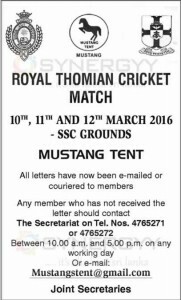 Here the joint secretaries announce, that if you wish to het Mustang Tent in the event on big match please do contact to The Secretariat on Tel. Nos. 4765271or 4765272 Between 10.00 a.m. and 5.00 p.m.
Transport and Civil Aviation Ministry Nimal Siripala de Silva said a new terminal building will be built at the Bandaranaike International Airport (BIA) at a cost of Rs. 65 billion. He further state that the present terminal building can accommodate only six million passengers. Where the BIA capacity is not sufficient to handle all passenger movements and air freight as last year alone there had been over 8.5 million passenger movements. That is why the government planned to construct a new terminal building for the airport. He said accommodation facilities should be improved to attract tourists to the country and If we do not follow international standards in building airports and improving facilities according to passenger demands, airlines will not come to Sri Lanka. And he further state the existing runaway will repair at a cost of Rs. 200 million while new runaway will be constructed at a cost of Rs. 8 billion as there is a necessity of a new runaway to accommodate more aircraft. SriLankan Airlines Chairman Ajith Dias states proposal for an MRO at the Mattala international airport was in the pipeline for several years but it never got off. We are now in talks with an Asian counterpart to get this project of the ground at least now and this MRO will help the bottom line of the airline to a great extent as they could harness big business due to SriLankan Engineering’s track record. He further said Srilankan Airlines are going to re-evaluate to begin domestic operations next year by acquire two 40 seater aircraft for this operation and hope to operate regular flights to selected domestic airports out of total 12 domestic airports in Sri Lanka. and with increased tourism we see great potential in this project. Commenting on the re fleeting of the airline by the end of this year they will have seven new aircraft increasing the total fleet to 20. In the next two years we will get eight more. Subsequently all ageing A340 aircraft will be retired and Sri Lankan will have a fleet less than 3 years of age. All these aircrafts will be for SriLankan Airlines and not for Mihin. With the new aircraft the national carrier will add more frequencies to key destinations. The airline may not look at new routes but will increase frequencies to existing destinations that include China, London and India. Top officials from one of the world’s leading township developers, Korea Land and Housing Corporation were in Sri Lanka looking for a township development project to the value in excess of USS 5 billion. The team met senior officials of the Megapolis Authority last week and informed that they are here on a fact finding mission to build a mega township development project which would be one of the biggest in South Asia. The official said We are keen to create a new city in the Western Province in an area of around 300 hectares of land. He further said that with the new political developments, Korea Sri Lanka relations have reached a new dimension and they were also very impressed with the concept of Megapolis. This is the new trend of the world and we are happy to note that this is being followed by Sri Lanka even at this late stage. The official said that they would clear the given land and have modem infrastructure in place for a ‘Mega City’ and then invite Korean and other investors from around the World to build housing, recreation, commercial and other facilities in it. The company, then plans to link the proposed ‘City’ with a speed train which too would be included under the project. And ministry also said that they have similar projects located 50 km off the capital and they are connected with a speed rail link. Due to this link a resident in the ‘Township’ could get to the Capital in less than 20 minutes. Another first for Sri Lanka would be the special bus and speed train service where the station and the bus stand would have the route, arrival and departure times of each bus/train on a digital screen. He also disclosed that Indian Prime Minister, Narendra Modhi too had requested them to build six similar models in India and they are currently engaging this. The solar power plant set up at Buruthakanda in Hambantota under the clean energy programme supplies electricity to over 800 rural houses. 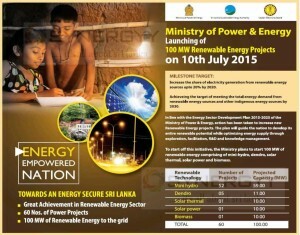 This is to fulfill the target is to achieve 10 percent of power generation using renewable energy. The pilot project will try to realize the full potential of solar energy by mitigating risks associated with it, said an engineer attached to the project. According to a survey conducted recently, 11,000 families in Hambantota use kerosene oil lamps as they are not provided with electricity. The Korean government has agreed to increase the number of jobs provided to Sri Lankans said so following a meeting with Provincial Councils and Local Government Minister Faiser Musthapha and Korean Ambassador Wonsam Chang. He further said korean ambassador promised to offer technical needs for local government institutions and developing bilateral ties between Korea and Sri Lanka. Social Empowerment and Welfare Minister S. B. Dissanayake stated that all officers in the Samurdhi scheme are entitled to receive an instant Rs. one million (Rs. 10Lakh) loan from the Samurdhi Fund. The Samurdhi Fund has exceeded Rs. 100 billion and all the Samurdhi officers can obtain a Rs. 1 million soft loan. Samurdhi officers can utilise this soft loan for house constructions, other development activities or to settle a loan, which they have already obtained. Ministry of Labour stated that In pursuant to the Employees Provident Fund Act No. 15 of 19S8, as amended by the Act No. 02 of 2012, for each member of the Employees Provident Fund employed at present, release of thirty per cent (30%) of the sum having credited to his personal account, for the purposes of Housing / Medical Treatments is scheduled to be commenced from 27th May 2015. Should be employed at present. 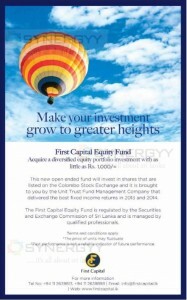 Should have contributed to the fund for a period not less than ten years. Should have a sum of not low than Rs. 300,000/ “ (Three lakhs) credited to his personal account (I.e., His membership account balance, audited by the Central Bank of Sri Lanka, should be not less than Rs. 300,000/ -(Three Lakhs). Constructing a house in his own land. Purchasing a land to build a house. Settlement of a balance amount of a housing loan obtained from approved bank. Hospitalization for a period not less than fourteen (14) days, due to occurrence of an accident. Applications for The health benefits could be made on behalf of the member, spouse and children. The maximum sum that could be obtained for one of the matters of above purpose should net I exceed rupees Two Million (Rs 2,000.000.00). Specimen application for the perusal of basic qualification* for the payment of 30% pre-retirement benefits is annexed herewith. Duly completed applications, as per the specimen should be sent by registered post, addressed to the Commissioner of Labour. 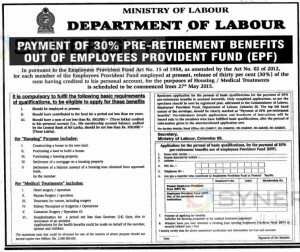 Employees’ Provident Fund, Department of labour. Colombo 05. The top left hand corner of the envelope, should be clearly marked as ‘Payment of 30% pre-retirement benefits”. Pre-retirement benefit applications and brochures of instructions will be issued only to the members who have fulfilled basic qualifications, after the perusal of Information given In the aforementioned application sent. The Universal Knowledge Education Centre has taken steps to organize a national Educational Book Fair at Uva –Wellassa in this literary month; September 2015. The Book fair will be held from September 20 to 30 at the Monaragala Community Centre from 8 a.m. to 7 p.m. The book fair is organized in Monaragala to benefit readers in the remote areas of UvaWellassa. And ranges of books are available at an affordable price. Sri Lanka Transport Board (SLTB) formally known as CTB operaing luxury buses from Kadawatha to Matara from today 17th September 2015. Buses will be start from every hours to Matara and Galle from 6.30 in the morning. The bus fare will be Rs 400 per person to Galle and Rs. 500 per person to Matara. 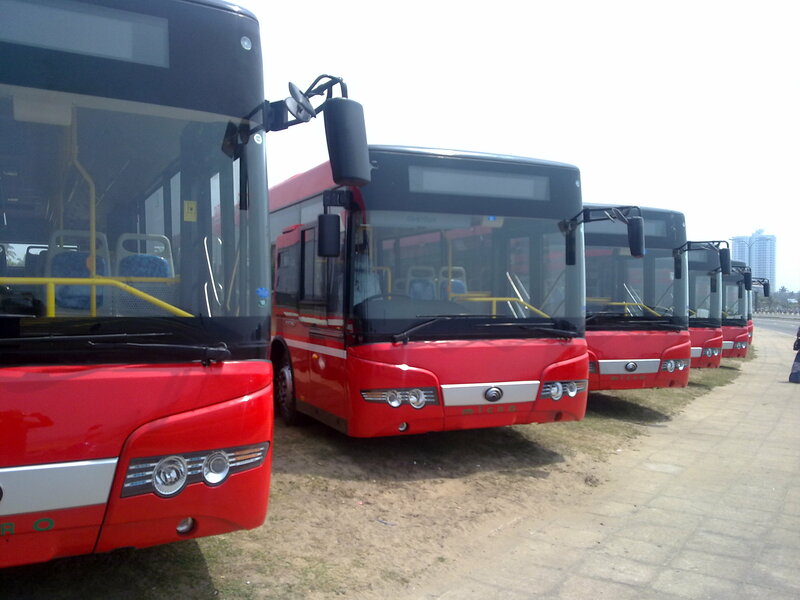 There are buses will be commence from the Kadawatha bus stand and stop at Galle and Matara bus stands respectively. The Colombo Municipal Council (CMC) had taken measures to install a Wi-Fi zone at the Viharamahadevi Park to provide free Wi-Fi facilities to people visiting there. The CMC said the project would be launched toda at the Viharamahadevi childrens theme park. Colombo Mayor A J. M. Muzammd together with chairman of SLT. P.G Kumarasinghe Would be present to inaugurate the Wi-Fi zone to the use of the public thereafter. The Wi-Fi facility and the equipment for it were provided by the Sri Lanka Telecom (SLT) on a request made to it by the CMC. The government had previously established Wi-Fi zones at 26 public locations including the Fort Railway Station, Pettah Public and Private Bus Stand, the Pettah Floating Market, Colombo Law College, Colombo Public Library, Dehiwela Zoo, Colombo Racecourse, Colombo Police Headquarters, Galle Face Colombo, Foreign Employment Bureau in Battaramulla and Colombo Museum. A special train service will be in operation from August 25 to 29 for the large crowd witnessing the Kandy Esala Perahera, a spokesman for the Railway Department said. The trains will function from Kandy to Colombo, Colombo to Kandy, Kandy to Matale and Matale to Kandy, Kandy to Nawalapitiya and Nawalapitiya to Kandy. The train leaving Colombo at 9.30 a.m. will reach Kandy at 1.15 p.m.
August 30: The train leaving Colombo at 7.05 a.m. will reach Kandy at 10.00 a.m. The train leaving Kandy at 11.45 p.m. will reach Colombo at 3.00 a.m. The train leaving Matale at 3.30 p.m. will reach Kandy at 4.47 p.m. The train leaving Matale at 08.45 p.m. will reach Kandy at 9.45 a.m. The train leaving Kandy at 1.55 p.m. will reach Matale at 2.27 p.m. The train leaving Kandy at 10.45 p.m. will reach Matale at 11.54 p.m.
August 29: The train leaving Kandy at 11.55 p.m. will reach Matale at 1.13 a.m.
August 30: The train leaving Kandy at 2.40 p.m. will reach Matale at 4.03 a.m. The train leaving Kandy at 11.55 p.m. will reach Nawalapitiya at 1.52 a.m.
August 29: The train leaving Matale at 12.40 a.m. will reach Colombo at 1.55 a.m.
Official announce that 517,123 votes rejected on 17th August 2015 General Election held in Sri Lanka, this is due to lack of awareness among voters on the complicated voting process and a large number of candidates. In overall 3.3 Million voters who doesn’t vote this election out of 15 Million registered voters. The Gampaha district recorded the highest number of rejected votes, with nearly 56,246 votes has been reject. Sri Lanka’s three expressways — Southern, Katunayake and the Outer Circular Highway will be toll free from 6 am to 6 pm tomorrow in view of the general elections, a Highways Ministry official announced. In line with the Energy Sector Development Plan 2015-2025 of the Ministry of Power & Energy, action has been taken to increase new Renewable Energy projects. The plan will guide the nation to develop its entire renewable potential while optimizing energy supply through exploration, facilitation, R&D and knowledge management. To start off this initiative, the Ministry plans to start 100 MW of renewable energy comprising of mini-hydro, dendro, solar thermal, solar power and biomass. 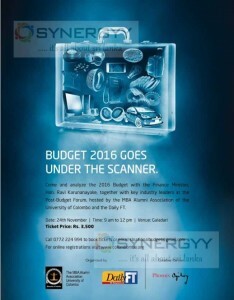 Increase the share of electricity generation from renewable energy sources upto 20% by 2020. 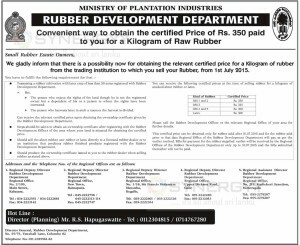 Rubber Development Department of Ministry of Plantation Industries Convenient way to obtain the certified Price of Rs. 350 paid to you for a Kilogram of Raw Rubber from 1st of July 2015. The person who enjoys the rights of the land though he is not the registered owner but a dependent of his or a person to whom the rights have been entrusted. The person who harvests latex in such a manner the harvest is divided. Can receive the relevant certified price upon obtaining the ownership certificate given by the Rubber Development Department. Steps should be taken to obtain an ownership certificate after registering with the Rubber Development Officer of the area where your land is situated for obtaining the certified price. Should sell the sheet rubber, raw rubber or latex directly to a licensed rubber dealer or to an institution that produces rubber finished products registered with the Rubber Development Department. Should produce the ownership certificate issued to you to the rubber dealer when selling rubber as stated above. You can receive the following certified prices at the time of selling rubber for a kilogram of smoked sheet rubber or latex. Please call the Rubber Development Officer or the relevant Regional Office of your area for further details. This certified price can be obtained only for rubber sold after 01.07.2015 and for the rubber sold prior to that date Regional Office of the Rubber Development Department will pay as per the earlier method. Bills for payment for the rubber supplied earlier will be received by the Regional Offices of the Rubber Development Department only up to 10.07.2015 and the bills submitted thereafter will not be paid. The Department of National Botanical Gardens recorded a revenue of Rs. 200 million from foreign and local tourists within the last six months. Nearly 935,000 local and 180,000 foreign tourists had visited the Botanical Gardens maintained by the Department at Peradeniya, Hakgala, Gampaha, Avissawella and Hambantota.